Marine biology runs deep in the Blinks family. Anne Hof Blinks had graduate training in marine biology at Harvard. There she met and married another marine biologist, Lawrence Blinks, moved to California with their son John, where Lawrence became professor of marine biology and head of the Hopkins Marine Station of Stanford University. Anne continued her studies on marine algae, along side her husband at Hopkins. Carrying on his family's tradition, her son John spent summers and his retirement years at the Friday Harbor Labs where his work on the jellyfish is legendary! To honor his Mother, in 1996, John and his wife Doris Blinks established the Anne Hof Blinks Fellowship Endowment. It is a special fund, one that supports students of diverse backgrounds in marine science studies. Blinks scholars perform research with faculty who also are of diverse backgrounds from across the country as well as our own FHL faculty. The success of these students has resulted in wonderful symposia at the end of the summer session, in papers at professional meetings and a development of passion for research, so important for the development of future marine scientists. It is wonderful to look into the life of Anne Hof Blinks. 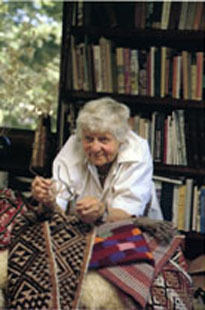 She is described as a weaver and a textile scholar. Her descriptive titles of mentor and friend (Koehler article in Spin-Off, 1993) and In Celebration of the Curious Mind (a festschrift to honor her 80th birthday edited by Rogers and Stanley, 1983) tell of an incredibly interesting woman, mentor and scholar. Not only did she research textiles from prehistoric people from numerous countries, she replicated their methods of processing fibers and spinning techniques to produce the historic unusual effects. The South American textiles were of particular interest to her. Her research often crossed over to understanding the genetics that produced certain superior wools that led to selective breeding and raising sheep and other animals for many years. To quote Koehler, "She expects each of us to explore beyond routine assumptions into new areas of thought. "It is that kind of mentoring and assumptions that characterize the Blinks Scholars, and we are very grateful to the Blinks family for creating dreams and possibilities for all students. To support the Anne Hof Blinks Endowment with an online donation, please visit the UW Foundation website.